Trackback? What the Heck is THAT? I didn’t know that I didn’t know about trackbacks! I just thought linking to another blog was a trackback but it is not. First, let’s start with linkbacks – something that notifies another blog author that you have linked to one of their posts. There are 3 types of linkbacks: refback, trackback, and pingback. If you want really detailed information, the Wikipedia article on Linkbacks has some to peruse, but here is a quick summary. My blog is on WordPress, so if I link to another WordPress blog, the pingback happens automatically. If I want to do a trackback to a blog on another service, there is a field on the publishing page that I can fill out with the URL of the post on the other blog. The notification gets sent at the time that I publish the article. For an example (and a test, since I’ve not done this before), I will reference a blog post in my friend Mallory’s blog, For the love of beads. The post is an uplifting post about the Winter Solstice called I have Waited for This Day. It has a great snow picture too – check it out. So, all I have done so far is to link to her post. If you click on it, you will visit her site – that is a refback. Now (again, for WordPress) I can put the link to her post in the Send Trackbacks field on my blog post publishing page. That should put a comment on that blogpost that I have linked to it. I think. I will update this post to let you know if this is correct! It did work! There is now a “Links to this Post” section at the bottom of that post showing this post! Woo hoo! I checked on Blogger and I found an article that states that it does not support trackbacks, but does support backlinks (which is not even in my list, argh!). The Blogger blogger (hee hee) has to have that set to show the links on the post, which Mallory apparently does. I don’t know how someone using Blogger can force a trackback to someone on another blogging service, or if it just happens automatically. And here is a gratuitous picture of beads, because I hate to have a post without eye candy. Now, I heat the plug. I heat from the bottom – my rationale is this: the silver is going to burn off, and it might as well fume the ivory while that is happening. I really have no idea if this makes a difference, but that is what I do. When I heat the plug, I always try and aim toward the center of the plug. It is hard to explain and the pictures don’t show it very well… But when I’m heating the right side of the plug, my right hand is closer to me, and when I’m heating the left side, my left hand is closer to me. The motion is sort of like steering a bicycle. When the glass starts to melt, my self talk changes the name of the plug to a gather; I’m sure that this makes all of the difference [said with a touch of sarcasm]. More Heat - Let's Call it a Gather Now! When the gather is thoroughly heated, I bring it out of the flame, and wait. How long? Until it is ready. I know when it is ready, because I have made lots of them, and I just know. It is mushy and soft, but not runny – it also looks different; I have heard it described as “forming a skin”. I often stand up at this point. If this gather drops, I do NOT want it on my lap. Gather Out of the Heat - Wait!!! Then I pull, just a little, and wait. It will begin to droop on its own. If I didn’t wait long enough in the last step and it starts to droop too fast, I blow on the punty ends. CAREFULLY! Burned lips are bad. Letting the center droop before pulling keeps the ends from being real thick and being like “dog bones”. Pull the Gather Just a Little - Wait! Once it stops drooping on its own, I start to pull harder and faster. The slower the pull at this point, the thicker the final stringer will be. Finally, I pull firmly on the finished stringer. I wait 10 or 15 seconds at the very least to make sure that the stringer stays straight. See the nice lines on this twisty? Perfect! I finish by flame cutting it in the center and then trimming the stringer from the punties with my tile cutters. All material contained within this Tutorial is protected by Copyright, “Spawn of Flame” Rosemarie Hanus, 2009; all rights reserved. Rosemarie Hanus makes beads in her home studio. Almost all of them use Silvered Ivory Stringer – Look at these beads at Etsy, Art Fire, or her Spawn of Flame website. I gently heat the plug, concentrating the heat near the outside. I try to keep the inside from getting warm or the plug will start to stretch out. This is not a good thing, because if it gets too long, the foil will not reach the end of the stringer. So, if it does get too hot, just tidy it up with the mashers again until it cools. Ok, so now I finally have the outside of the plug hot, and the inside just right. Tip – I keep the mashers in my “not rolling” hand in preparation for the next steop. I place the plug onto my marver next to the foil. Doing it this way helps to assure the the end of the foil is attached. Then I start rolling the plug toward the foil, onto the foil, and continuing to roll until all of the foil is on the plug. The photos are taken by my lovely assistant, Katie, so they are from the perspective of an observer. My position is actually so that the direction of the rolling action is away from me. I would guess that this whole rolling sequence takes about 3 or 4 seconds. I would like to point out also that the foil does not go all of the way around the plug – I consider this to be a good thing, I believe that it introduces more variety into the final bead. Now I have the foil onto the plug and I use my mashers to secure the foil onto the plug. I want to work fast, so remember at no point in this process have I put the mashers down. They are also still warm from the plug making operation. Mash firmly, but not so much that the plug gets squished out. As the plug cools, I use more pressure and also begin to roll the plug a little in the mashers. Then I use the edge of the mashers to finish burnishing the foil onto the plug. I like that foil firmly attached. Now, I punty the second clear rod to the end of the plug. Just heat the end of the plug and the clear rod and push them together. Next… the conclusion: Heat and Pull. Continuing the tutorial, here is another of my “secrets”. I use a clear core in my stringers. It gives me a little more control when applying the stringer (clear is more stiff than the ivory) and I think that it makes the ivory bubble more when finishing the bead. Besides, clears are notorious for having bad batches and it is a good way to use it up! I should mention that if you are not used to pulling a large gather of glass that you should definitely wear a leather apron at the very least to protect yourself. I also will mention that it is your responsibility to take other normal studio safety precautions, including adequate ventilation. This process involves burning fine silver. Notice that I use a thicker rod of clear – approx 6 mm. Sometimes I use smaller, but I like this size. Starting about3/4 inch (1.5 cm) from the end of the clear, I start wrapping the ivory around. The wrap thickness itself is pretty thick. This is what it looks like immediately after finishing the ivory wrap. Now I want to smooth the bumps. I heat the ivory wrap and use my mashers to smooth it out into an even plug (my term). I use a very light touch here, because I don’t want the plug to get longer and thinner; I want it to stay nice and thick. I usually heat and mash several times. I also rotate the clear rod around so that the plug gets pretty smooth. Using the mashers instead of rolling it on a marver assures that both ends of the plug are the same size and it keeps the glass up near where I can see it better. I use the mashers to flatten the end of the plug too. It’s not necessary, but I like to keep it tidy (the glass – not my workbench, as you can plainly see). One tip here: compare the length of the ivory plug to the width of the silver strip. They should be close, with the foil being maybe just a little wider. Next up – “Getting it On!”… the silver of course! This is a tutorial, not an expose! To say that I use a lot of Silvered Ivory Stringer (SIS) is a huge understatement, and I thought that I would show how I make my version of the stringer. It would give non lampworkers a look at one of our techniques, and it would give away my trade secrets to allow me to share with my fellow lampworkers. It’s ivory glass, rolled in fine silver foil and then pulled into long glass strings (stringer). These stringer are used as an artist would use a pencil or paintbrush…to melt on fine designs. The reaction of the silver and ivory form a webbing and curdling effect that is both organic and mesmerizing. These are the same steps that many lampworkers would use (I would say all lampworkers, but I’m an engineer too, so I just can’t bring myself to make that strong of a statement…), however, I do some things in my own specific way, so that I have a repeatable and reliable result. This tutorial also quite long, so I’m splitting it into several posts. For a teaser, here is how I prepare the silver foil. First of all, notice that I use fine silver foil. It seems to give a better result, and it is easier to work with than fine silver leaf. I get one piece of foil and place it in the front of the foil booklet. I then cut it into 8 mostly equal pieces with my razor knife. I slice it in half, then I slice one side into halves and finally each of those quarters in half. I hold the foil with my other hand so that it does not bunch up. I just estimate where the cuts should be – that is close enough. With practice, it is easy to tell how much pressure to use to make a nice cut. Next, I place a tiny amount of water onto my marver, with the water concentrated on the side away from me. The water holds the foil down so that it does not blow away or fold onto itself. Finally, I put one piece of the foil onto the marver. I try to make sure that the edge of the foil closest to me is not on the water; I want that edge loose so that it will stick to the glass easier. If the edge is on the water, as it is in the photo, it just makes it a little harder to pick up the foil. Even more important, there needs to some room on the marver on the edge closest to me. Tired of bent mandrels, stuck beads, or worse yet, chipped beads? Do I have the solution for you – a riveting tool. This was not my idea, and when I first heard it, I had no idea what a riveting tool was, nor did I know how to use it. Here is a very inexpensive tool that I bought at Harbor Freight. It is actually called a Hand Riveter set; it came with different size nosepieces as well as a variety of rivets also. I have never changed the nosepiece to a different size. I then squeeze – gently. Very, very gently! The riveting tool holds the mandrel in place and pushes the bead forward. Usually this is enough to loosen the bead enough to pull it off. If not, I just pull the mandrel to move the bead against the nosepiece again and repeat. This method sure is easier then holding the mandrel with a bench vise and twisting the bead. I have had limited success with that method anyway. Rosemarie Hanus makes beads in her home studio. Look at some more of these beads (already removed from the mandrel) at Etsy, Art Fire, or my Spawn of Flame website. As promised, here is how I make shipping labels for international packages. I use the USPS Shipping Assistant®, provided by the United States Postal Service. It can be downloaded from the link and installed onto a Windows system. Unfortunately, it is apparently not available for a Mac. Since I use this package only for international shipping, I have set the defaults for international first class packages. To set these defaults (on the version that I have), first click “preferences” in the upper right corner of the Shipping Assistant screen. There will be a series of selections on the left side of the screen. I modified two of the selections: General and International Label. In the General Preferences window, I set the “open shipping assistant” to “International Shipping Label”. This was the only item that I modified in this window. I modified quite a number of items in the International window. Most of my packages are under 2 ounces, so I set the default weights accordingly. I then add each item. In the upper right area, there is a section called “Items: Content Detail”. I already showed how I set the default to 1 ounce and “Craft Items”. I enter the value of the item. I ship with the receipt, so this number is the same as the sale value of the items. Click “Add Item” and that is added to the Description. If I ship multiple beads or multiple sets, I add each item separately. After all of the information has been entered, click on the calculate button. This will show the amount of postage due. It is not necessary to do this right now, you can just click the Print button. I believe that you can save the labels and print a batch of them at a time, but I only do one at a time. After the label is printed, I cut it, then glue and tape it to the bubble mailer. These labels fit quite nicely on a 000 bubble envelope. Again, I hope that this helps someone with their shipping! Rosemarie Hanus makes beads (that she prints shipping labels for) in her home studio. 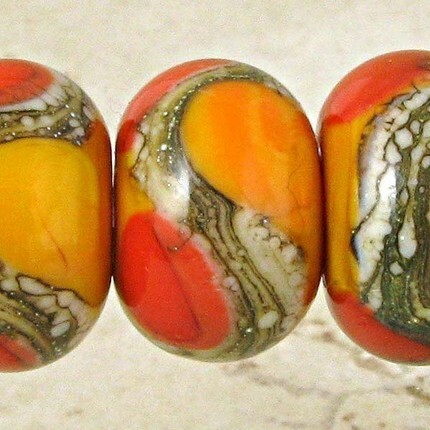 Look at some of these beads at Etsy, Art Fire, or my Spawn of Flame website. Fire Divas – What’s New?